Today I decided to check and see if I could turn on HD Voice on my Google Nexus 6 but I could not. 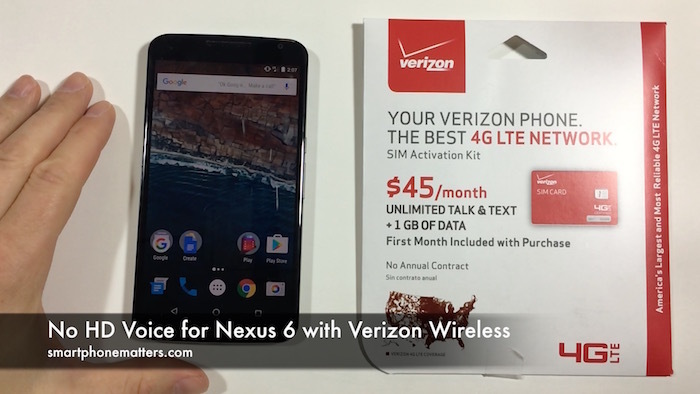 Verizon used to sell the Nexus 6 so I thought I’d check to see if maybe they added support for it to the phone. My guess is that the phone is perhaps a little too old. Before getting started, I updated my Nexus 6 with all of the patches available so the phone is up to date. After putting the Verizon Wireless SIM in my phone, I checked under Settings > Wireless & Networks but there were no options for Advanced Calling or Wi-Fi Calling either. I also looked in the Phone app under Settings > Calling but there was no option for Wi-Fi Calling there. I did find out that simultaneous voice and data work however. I made a call then I was able to open Chrome and browse smartphonematters.com. So while it was disappointing to not have all the features of HD Voice and least voice and data work together.